Seeking info on fans for a Newer Technology - MAXPower G4 7447A single processor upgrade. As the Sonnet and the NewTech appear so similar, think I’d prefer the seemingly, lower profile Sonnet fan info. (Perhaps a mistake?) Target Quicksilver. AND, anyone owning the same single-processor variant NewTech… the 1.6GHz switch settings would be nice too. Online mauals note SW1 and SW2 settings, but this one has SW1 and SW3 (under heatsink) switches that need setting and I’ve no pertinent documentation on this processor. After fans, trial and error switch settings may ensue. 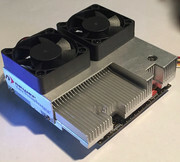 Again, this is a single processor unit that does not have the 2nd set of switches as seen in the cut-out areas of the heatsinks, pictured below. 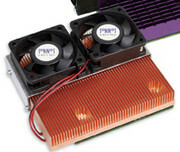 Added a pair of Evercool 50x50x15 - 4500 RPM fans. With great help from E.M. and C.A @OWC… the SW3 switch (under the heatsink) sets the core voltage of the CPU and is not to be set using the same switch settings as those provided in the chart (from the manual - like SW1 and SW2) for the dual processor version. Okay for SW1 (and SW2 when present), but not SW3. Considering the age of this single processor upgrade and its’ unknown history or long-term exposure to heat… gradual speed testing stability & performance from slow-to-faster settings has been strongly advised. Intend to eventually attempt the original 1.6GHz settings. However, that will be with a higher volume, constant-on CPU fan… (instead of the original stock, variable speed Quicksilver CPU fan)… monitoring performance stabilty and temperatures testing through the various speeds noted above. Seems that many of these processor upgrades fell victim to higher temperatures via the somewhat odd Quicksilver cooling fan(s) setup arrangement. Hopefully, testing will begin... later this coming week.